The OFC Education Centre student-athletes have lined-up a unique itinerary of activities over the school holidays, exploring new codes and perspectives of the game to diversify their knowledge and experience. The first challenge for the team was trading their boots for court shoes to play the Solomon Islands, Samoa and Tonga U-18 national futsal teams in friendly matches ahead of the 2017 OFC Youth Futsal Tournament, kicking off at Bruce Pulman Arena in Auckland tomorrow. Solomon Islands lived up to their reputation and dominated in the first match, securing a 17-5 win, but the OFC Education Centre team showed improvement following the tough opener and fought Samoa and Tonga to a 4-4 draw and 8-1 win, respectively. OFC Education Centre coach and mentor Phillip Pickering-Parker said that the objective of the friendly matches was to develop the student-athletes’ adaptability and mental strength in a competitive environment while also providing the national teams with a warm-up ahead of tomorrow’s kick-off. “The games were all about giving them an opportunity to grow their mind-set. We want to help them become adaptable to different circumstances and different situations, plus futsal has been widely recognised as an important developmental tool for football players,” he said. “It was a great experience for the boys. To have all these friendly internationals in the space of maybe 36 hours is quite a big feat for these boys. 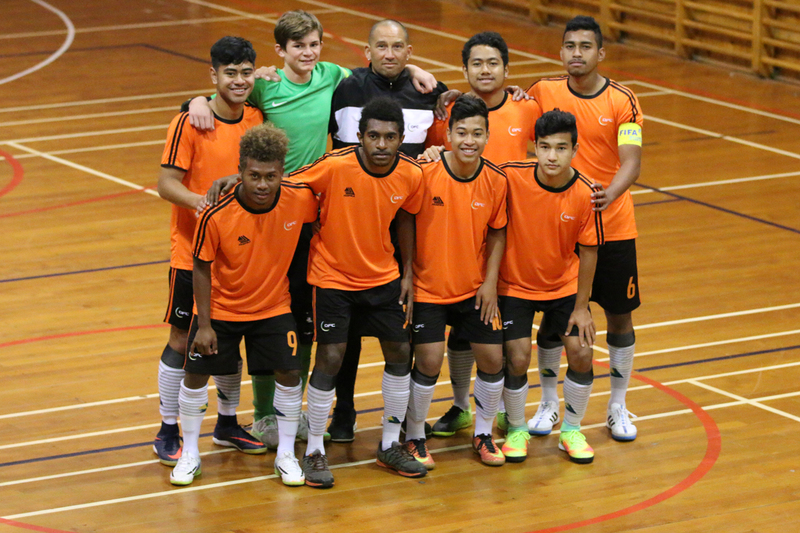 Fiji student-athlete Mohammed Naizel – back for his second term in the programme after being selected for the inaugural intake last year – enjoyed his first taste of futsal and was very grateful for the opportunity to take the court against the some of the best talent in the region. “I’m really proud to be here in the OFC Education Centre because it’s taking me so many places. I’ve never played futsal in my life so it’s a big achievement for me to play in these international games,” he said. “After coming into a whole new environment and only training for three days, I think we have done well and I’m proud of the boys and the coaches too. With their futsal assignment now over, the OFC student-athletes turned their focus to another aspect of the game and joined AFF Football Development Officer Nic Downes in an NZF Introduction to Junior Coaching course this afternoon. After witnessing the student-athletes enthusiasm to learn and share knowledge over the past week, Pickering-Parker is confident that the team will jump on board and make the most of the course. “Over the last couple of days coaching in a holiday programme, the boys have really enjoyed hanging around with the kids and showing them a few skills,” he said. “The objective of the coaching course was really to give them a little bit more of an understanding of how coaches plan and think.